Nice sidewalk, still empty but safe from traffic on this afternoon a month ago. The spiffy new sidewalk along North Albany’s Gibson Hill Road is ready for Wednesday. What’s so special about Wednesday? Well, Oct. 7 is Walk and Bike to School Day in Oregon and elsewhere in the U.S. That, anyway, is what it says in a press release from ODOT. The Gibson Hill walking path was made possible because the city of Albany got $1.2 in federal grant money, which covered the $864,100 construction contract and associated expenses. Albany had sought the grant in response to a request from parents some years ago. The parents were interested in safety. They wanted their kids to be able to walk to and from school protected from the traffic on Gibson Hill. The sidewalk was finished two or three weeks ago, and I’ve seen people use it. Not many, I’d say, but more than one or two. Let’s hope that children will use it too on their way to school and back. 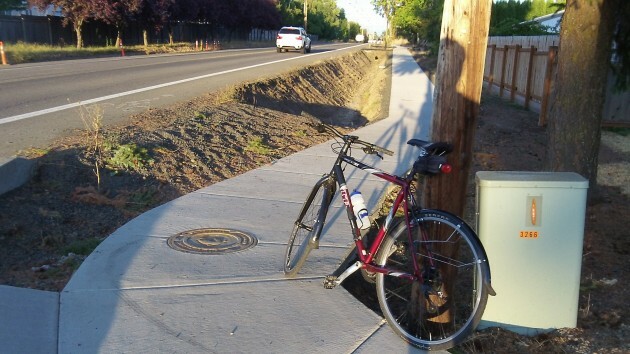 The path is for walking, not biking. It may be safer but the city did not think through that project nor the roundabout at N. Albany Rd. and Gibson Hill. When the roundabout was done they should have thought ahead (I’m sure the idea of sidewalks on Gibson Hill must have been broached somewhere along the line) and included fill on the west side of N. Albany Rd. The signal light at the drive into NAMS and N. Albany Rd has pedestrian crossing signals – therefore one would think that this would b e a SAFE place to cross and proceed on to the north and to the sidewalk on Gibson Hill Rd. Nope – either stay on the east side and proceed to the roundabout then take the less than safe crosswalk to the west side or cross at the light go to Quarry Rd and, again use the less than safe cross walk to the east side and repeat at the roundabout. Somewhere the ball got dropped and, undoubtedly, at some future date this will be done at a higher cost. Planning and Foresight???????????????????? Don’t think so. Nice to see more walkers, bikers, etc… of all ages along that road. I’m curious as to the landscape planning for the ditches and curb side areas. I’m kind of fond of the cattails myself. 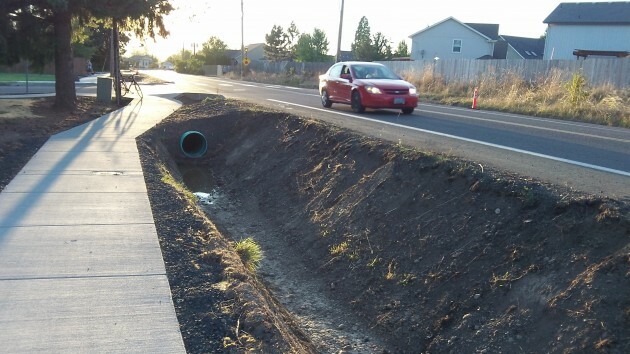 Why can’t drainage pipe be laid to connect with the existing pipe and the ditch backfilled completely and landscaped? Far safer than an open trench I think.